When the new 2019 Subaru Ascent 3-Row family hauler broke cover at the LA Auto Show earlier this month, it got a huge boost in shopper interest. Auto shows have become more than just seeing the latest cool concept cars that will never see production. New data shows auto shows are having a bigger impact on consumers’ shopping than in the past. They are now more about unveiling actual production vehicles consumers are interested in, like the all-new Subaru Ascent. Shoppers who attended the LA show got a good look at Subaru’s new flagship all-wheel-drive family hauler even though it won’t be in showrooms until next summer. They could open the door, sit inside, and check out Ascent’s standard EyeSight driver assist technology, X-Mode off-road feature, 8.7 inches of ground clearance, and its 72.6 cubic feet of cargo carrying ability. Inside shoppers also saw Ascent’s 19 cupholders, 4G LTE Wi-Fi, 8 available USB ports, heated and ventilated front seats, rear-seat climate control and 2nd and 3rd row sunshades at the show. 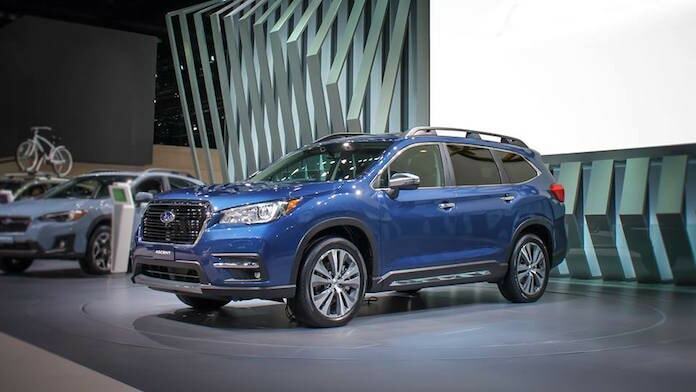 The all-new 2019 Subaru Ascent family hauler had a 107 percent lift in share of shopper interest, and The Detroit News said the new 3-Row vehicle was one of the 10 best new vehicles on the floor. Now you can see the Ascent and other new vehicles at a car show near you. Indianapolis International Auto Show December 26 through January 1. North American International Auto Show in Detroit, January 17-28. Subaru expects the new all-wheel-drive vehicle to be a big hit with current customers looking to move up from an Outback, Forester or Crosstrek and families looking for a 3-Row crossover who have never purchased a Subaru vehicle before. The all-new 2019 Subaru Ascent won’t arrive in showrooms until next summer, but you can see it a car show near you. What new cars will you be interested in checking out at your local car show next year? If you liked this article and think it may interest your friends, consider sharing or tweeting it to your followers. Looks like a nice looking SUV. I wonder how the new Subaru Ascent will compete with other SUVs in the same class? Will the redesigned 2019 Subaru Forester be on display at the upcoming Cleveland, Ohio Auto Show? The next-generation Forester won't revealed until later this year Rick. Thanks for reading!